Krennic's Imperial Shuttle Microfighter is one tough starship! Sit the Imperial Shuttle Pilot in his seat, arm the flick missiles, fold the wings down and get ready to travel the galaxy! This comes down to 12.76 cent per brick. 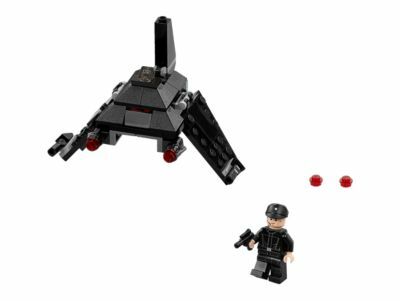 The Krennic's Imperial Shuttle™ Microfighter (75163) Lego set is no longer directly available from the sites below. However, 3rd party partners of these sites might still have the set available. Alternate description Fly in style with Krennic’s miniature Imperial Shuttle! Includes an Imperial Shuttle Pilot minifigure. Fold the wings up, arm the stud shooter and get ready for galactic adventures. Also includes the Imperial Shuttle Pilot's blaster pistol. Recreate your own action-packed scenes from the blockbuster movie Star Wars: Rogue One. Measures over 3” (8cm) high, 3” (8cm) long and 4” (11cm) wide with wings folded down.